Lower South Willow/Airport is situated on Cohas Brook, an outlet of Massabesic Lake in the south end of Manchester. Lower South Willow/Airport is bordered by Interstate 293 to the north, S. Mammoth Road to the east, the Londonderry town line to the south, and Perimeter Rd. to the west. Lower South Willow/Airport has had many names over the years, including Goffe’s Falls and Moore’s Village which commemorated the marriage of one of Goffe’s daughters to Captain Samuel Moore. On June 7, 1927, the Board of Mayor and Aldermen approved spending in the amount of $15,000 to begin development of the Manchester Grenier Field U.S. Army Air Corps Base. 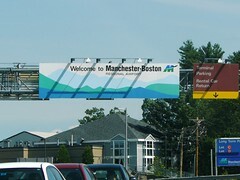 Today, Lower South Willow/Airport Neighborhood is home to the Manchester-Boston Regional Airport which welcomes millions of passengers to the area every year. The Mall of New Hampshire (completed in August 1977) is located just off South Willow Street and is home to 125 specialty stores serving customers from throughout New England and beyond.